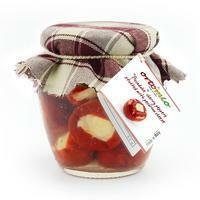 Ortomio sun-dried tomatoes with herbs in oil. 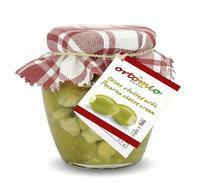 Ortomio Bruschetta Mix "Mediterranean Flavour". Ortomio Pitted Leccino Olives with Pine Nuts and Basil. Larged Pitted Green Olives Marinated with Garlic. Ortomio Borretane Onions in Balsamic Vinegar.